After the revolution which toppled the regime of Askar Akayev in Kyrgyzstan on 24 March, Russians and some other ethnic minority groups are leaving the country in larger numbers. The main reasons given are the unstable social, political and economic situation, uncertainty about the country's future and the fear of a possible civil war. "Before the events of 24 March, about 60 people a day came to the federal migration service of Russia in Bishkek. Today we receive about 260 people daily. It is possible that these numbers will increase in the coming days,” Boris Asaulyuk, a consular official at the Russian embassy in Bishkek, explained. The new exodus has also been fuelled by illegal land seizures around Bishkek and by nationalistic sentiments, some Russians in the country have said. Prior to independence in 1991, Russians comprised 22 percent of the population, according to official figures. A decade later, the number had decreased to 13 percent, or about 600,000 people. The number has been steadily dropping and today there are about 560,000 Russians left in Kyrgyzstan. About 200,000 of them live in Bishkek, according to data from the Slavic Fund, a local civic group representing the Russian minority. “Destabilisation in the country is causing the current migration. First of all, the new authorities have not clearly proclaimed their position towards minorities. This uncertainty makes people want to run away. Secondly, the looting of businesses, shops and companies has led to the unemployment of Russians in the city. Valerii Vishnevskii, chairman of the Slavic Fund, told IRIN. Moscow is ready to receive its countrymen and women and is applying special regulations speeding up citizenship for immigrants from Kyrgyzstan: "They can receive Russian citizenship in a simplified way within three months of their arrival in Russia,” Boris Asaulyuk, a consular official at the Russian embassy, explained. Evgenii Shmagin, the Russian ambassador in Kyrgyzstan, told his countrymen and women on Tuesday to stay calm and wait for the situation to return to normal. "Destructive forces are trying to hinder the normalisation of the situation and resist the first steps of the new Kyrgyz government to re-establish law and order.” Shmagin offered reassurance that he had received confirmation from the interim authority that it would respect the rights of all minorities, including Russians. Roza Otunbaeva, the acting minister of foreign affairs, tried to stem the exodus of Russians by organising a meeting of ambassadors from the Commonwealth of Independent States (CIS) on 14 April to reassure them that their citizens are safe in the new Kyrgyzstan. On Wednesday Otunbaeva went further and insisted minorities had a political stake in the new order. "We want to see Russians and Uzbeks [another minority group] in the government. Our parliament is already multinational enough. We need to see that the people in power are not nationalists"
Despite these official responses, Russians who have the resources to buy a ticket and resettle are planning their escape, even if they know they will face uncertainties further north. “Our children do not have any future here. We realise that when we leave for Russia we will be treated like foreigners there, but at least our children will grow as fully-fledged Russian citizens,” Elena, a Russian woman who has lived in Bishkek all her life, told IRIN as she jostled for a place in the queue outside the Russian embassy, keen to apply for emigration. The unprecedented night of looting in the capital that followed the demonstration of people power that brought down the government has scared many Russians and convinced them that they should leave. Dmitry, a Russian teenager, spent the early hours of 25 March defending the family business - a grocery shop - against looters together with other Russians. He said that from now on, he only feels safe if he has a weapon to hand. “It is good that I have my gun, I will keep it around until I sell my apartment and collect all the documents for emigration. I will eat and sleep with it,” he told IRIN. 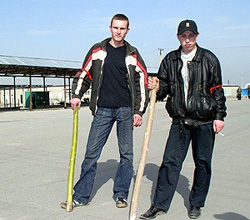 [Kyrgyzstan] Club-wielding Russian youths defending a Russian-owned shop in central Bishkek from looters. Russians have lived in Kyrgyzstan since tsarist forces slowly moved south, their advance culminating in the defeat of Tashkent, now the Uzbek capital, in 1865. The Kyrgyz were gradually eased into the tsar's provinces of Ferghana and Semireche. The new colonial masters gave huge areas of land over to Russian settlers, and the Kyrgyz put up with it until a revolt in 1916, which was heavily put down by the Russian army. Kyrgyz lands became part of the Turkestan Autonomous Soviet Socialist Republic (ASSR) within the Russian Federation in 1918, then a separate Kara-Kyrgyz Autonomous Oblast in 1924 and a full Soviet in 1936. Concern among the nation’s Russian community increased when they started finding fliers in Russian and Kyrgyz signed by Hizbut Tahrir - a radical Muslim organisation that seeks to turn Central Asia into an Islamic state - during and directly after the disturbances that ushered in the new era in the country. The leaflets indicated that Russians, mainly non-Muslims, would soon flee and that Kyrgyz people had a duty to take over their properties and businesses. “We have received this [Hizbut Tahrir] flyer at work. If in the beginning I was hesitating whether to leave or not, now I am convinced. We are leaving with my daughter as soon as possible to our relatives in Russia,” Liliya Vinogradova, a dentist, said. Since the collapse of the Soviet Union in 1991, Russians in Kyrgyzstan have had a harder time making ends meet, most having lost their privileged status that evaporated with independence. Their role in the political process has also been decreasing. By 2005 there were just two Russian ministers in Akayev’s old government. They both lost their jobs when the old order was swept away in March. In the new interim government, only Alevtina Pronenko, acting minister of labour and social protection, is Russian. In the previous parliament there were nine Russians in two chambers, in the new assembly there are only four. "Russians in Kyrgyzstan were in the most advantageous position compared to the other republics of the former Soviet Union. The attitude to the Russian-speaking population has been friendly. Even the Kyrgyz opposition did not try to play the so-called Russian card during the elections,” Boris Asaulyuk, chief of migration at the Russian consulate in Bishkek, told IRIN. But despite the reputation for tolerance, some ethnic Kyrgyz sense a growing xenophobia in post-Akayev days. “We have been under Russians for a long time. They humiliated us. Kyrgyz are very tolerant and friendly by nature, but for how much longer we will put up with this? Enough, let Russians go back to Russia! It will be better if they leave,” Nurmangazy Orokcheev, a Kyrgyz radio journalist said. Other local people said they had recently been spat on or abused for speaking Russian in public. Other Kyrgyz in Bishkek condemned expressions of nationalism and want Russians to stay because they have experience and resources too valuable to lose. “We have always been together and struggled through the transitional period together, we are one nation. One should not pay attention to some idiots appealing to nationalistic feelings," Yulduz Zholdosheva, a Kyrgyz teacher, told IRIN.